Receiving proofs in the post is always exciting. This particular soon-to-be-published book, Amazing, was inspired by my time working part time as a Special Needs Support Worker at Swindon College and it's one of very few trade picture books that feature a wheelchair user, the main character, on its cover. 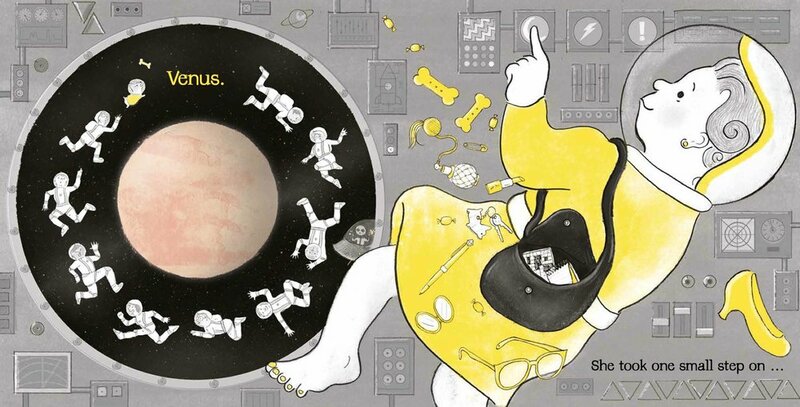 But in this, the wheelchair is merely incidental, which is not something you often come across in picture books. 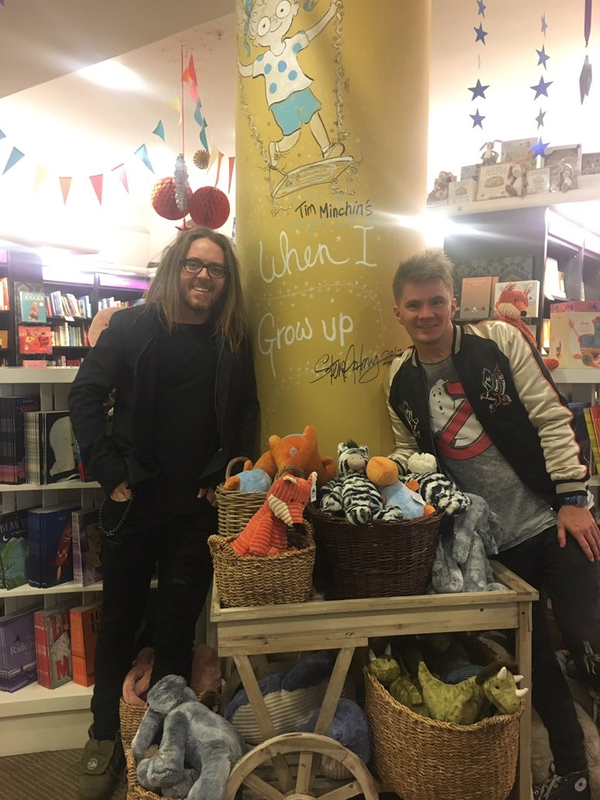 I often stick to limited colour palettes, with the exception of Tim Minchin's When I Grow Up, but I wanted this book to be really colourful and commercial-looking, because when was the last time you saw a disabled character on the front cover of a picture book in your local supermarket? 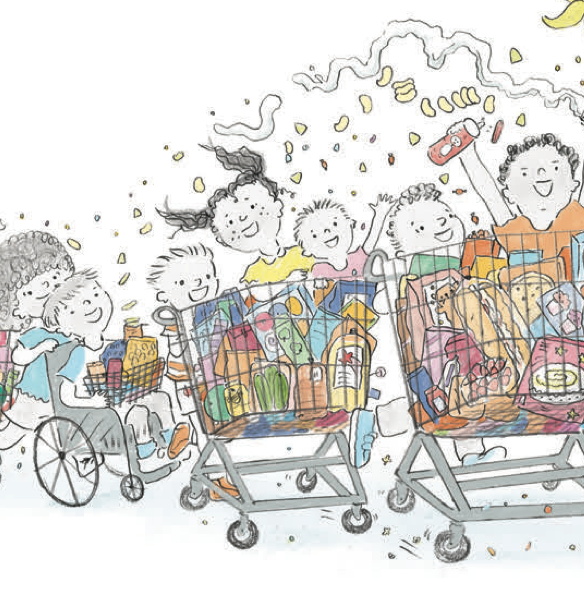 Only a very small percentage of (usually highly commercial) picture books make it into the supermarkets. Most are licensed character books, like Peppa Pig or Frozen. I'm fortunate in that all of my books are (or have been) stocked in the high street (Waterstones, Barnes and Noble, Smiths) and I'm forever grateful to all the indie bookstores who stock my books, not to mention libraries! 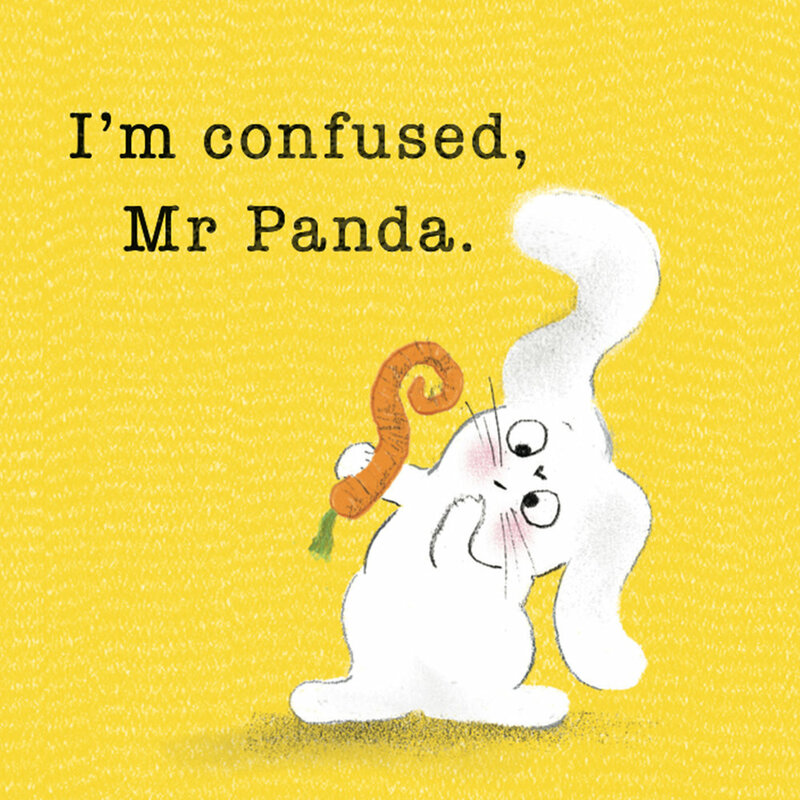 The Mr Panda books have even made it into Sainsburys (UK) and Target (USA) and other supermarkets around the world. That said, I'm really hoping this book receives the same level of support. Below is a peek at the proofs. Amazing is set to publish first in the UK in Jan '19. Suffice to say, this book features the planets of our Solar System (and little Pluto), but if you look hard enough you might just find the following. 1. Sputnik 1 - The first artificial Earth satellite. The Soviet Union launched it into an elliptical low Earth orbit on 4 October 1957, orbiting for three weeks before its batteries died. 3. Laika - Laika was a Soviet space dog who became one of the first animals in space, and the first animal to orbit the Earth. 4. Lunar Rover - A lunar rover or Moon rover is a space exploration vehicle designed to move across the surface of the Moon. 5. Curiosity - Curiosity is a car-sized rover designed to explore Gale Crater on Mars as part of NASA's Mars Science Laboratory mission. 6. Face on Mars - The "Face on Mars" was photographed by the Viking 1 spacecraft as it made its way to the Red Planet. The image shows what seems to be a giant humanoid face, carved out of or even built onto the surface of Mars. 7. Crop Circle - Crop Circles are geometric patterns that appear mysteriously in crop fields. The term was first coined in the early 1980s by Colin Andrews. Although obscure natural causes or alien origins of crop circles are suggested by theorists, there is no scientific evidence for such explanations. 8. International Space Station - The International Space Station is a space station, or a habitable artificial satellite, in low Earth orbit. 9. The American Flag - NASA's Apollo 11 blasted to the moon on July 16, 1969. Neil Armstrong, Edwin "Buzz" Aldrin and Michael Collins were the astronauts on Apollo 11. Neil Armstrong became the first human to step on the moon. They both planted the U.S. flag there. 10. Mice on the Moon - The myth that the moon is made of cheese has been around for millennia. The best-known early citation dates to 1546, and can be found in The Proverbs of John Heywood (which can be read in its entirety here). The document is a compendium of some of the titular author’s most famous sayings, such as “the more, the merrier,” “a penny for your thoughts,” and “Rome was not built in a day.” At one point, he jokingly states “the moon is made of greene cheese” (in this context, “greene” refers to the food’s age rather than its color). 11. A subtle reference to a popular American science fiction television series and movie franchise. 12. Mr Panda - Mr Panda is from my ongoing 'Mr Panda' series. He also appears in The Queen's Handbag and The Queen's Present. 13. Another nod to a popular American science fiction television series from the 1960s (this time, in the text). 14. The Queen's Hat - The Queen's Hat appears four times in this book. 15. The Sneaky Swan - This thieving swan stars in The Queen's Handbag, but he also make a brief appearance in The Queen's Present, too. 16. Royal Guard and Police Officers - These characters are from The Queen's Hat and The Queen's Handbag, respectively. 17. Blip - Blip stars in her very own book called Unplugged, but she does manage to make a cameo in The Queen's Lift-off. 18. A Lizard - This lizard is from my book, Green Lizards Vs Red Rectangles. 19. The Alien Butler - The Alien Butler has replaced the Queen's actual butler in this book, as he follows the hoards of astronauts through space with a tray of tea. 20. An Elf - This elf is from The Queen's Present. 21. A Comet - An icy small Solar System body that, when passing close to the Sun, warms and begins to release gases, a process called outgassing. 22. The Asteroid Belt - The asteroid belt is the circumstellar disc in the Solar System located roughly between the orbits of the planets Mars and Jupiter. 23. Contents from The Queen's Handbag including lipstick, perfume, a notepad, crossword puzzle, pen, a safety pin, compact mirror, spectacles, sweets and doggy treats for her corgi. 25. Big Ben - Yes, Big Ben, a nod to the first book in The Queen Collection, is somewhere in this book. Unplugged now out in the UK and US! A book release is always exciting and although this is my 12th release the feeling is still just as amazing as seeing my first book in print. But what's even better, and still something I find a little surreal, is seeing my characters take on a life of their own as they fly into bookstores, libraries, schools and the hearts of little readers. This is my third stand-alone title. My stand-alone titles often explore themes relevant to our times. Green Lizards Vs Red Rectangles was my reaction to the world becoming a much smaller place and how humans from different backgrounds often struggle to share the same space. Monster in the Hood has a similar theme but focuses more on learning not to judge someone based on preconceived and ignorant notions. The idea of Unplugged came to me when I almost walked straight into a lamppost. I was more interested in Twitter than where I was walking. I thought to myself, 'I seriously need to unplug!'. Unplugged is my reaction to today's obsession with social media and viewing life through filtered screens. It seems that whenever I go to a concert, show or even a nightclub, people are literally viewing their experiences through tiny smartphone screens instead of actually living, which I think is quite sad. For example, just the other day I was watching a David Bowie tribute act with my Dad and noticed someone watching the entire show through her tiny little phone. Then I saw someone else doing the same thing. It was like playing spot the millennial! But why are we all so obsessed with recording moments, taking selfies (which 10 years ago would have absolutely been considered to be completely self-obsessed and narcissistic) and staying connected every waking minute of the day? Of course, all of the above relates more to adults than children, but I personally think the best stories come from real life. I have never once tested any of my books on a child. Not once. And that's not even a conscious decision. I just get lost in my own little stream of consciousness without ever feeling the need to 'test the audience' because I'm not even thinking about an audience, I'm just writing a story and enjoying the creative process. It's cathartic. Anyway, so here we have Blip, the star of Unplugged. Blip is a She. Is this important? No. It shouldn't matter if Blip is a boy or a girl but I guarantee you that most people would make the automatic assumption that Blip is a boy. Heck, people who have read and reviewed the book have even misgendered her. Is this because all female children's characters need to have eyelashes and bows and dresses? "But how do you know Blip is a girl? ", a boy asked. There's possibly a conversation to be had here (I might blog about it) and we haven't even touched on the actual theme of the story yet. The story is ultimately about how great 'screens' are, but also how 'unplugging' is fun, too. Don't get me wrong, I love computers. When I was a kid I enjoyed playing Mario and watching my brother try to defeat the nefarious Mother Brain in Metroid. But my fondest and most treasured memories are of building forts in the desert, walking barefoot on hot concrete in the height of summer, discovering unusual animals amongst the tumble weed, pretending to be superheroes in the back yard, inhaling fresh mountain air for the very first time before stumbling upon the most beautiful waterfall I think I've ever seen. The list could go on and on and on. I was lucky. 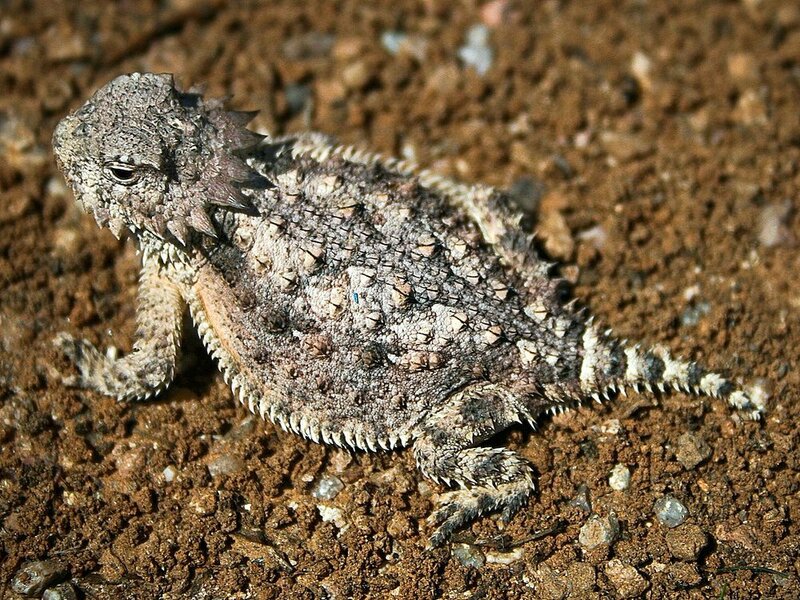 I remember stumbling upon a horny toad. Did you know they spit blood from their eyes!? In Unplugged Blip lives in a black and white world of computer activities. She sees and does literally everything through a screen. She visits faraway places, listens to music, does aerobics, solves problems, plays games and so on. But one day all of this changes when there's a power cut. Blip trips over her wire, accidentally unplugging herself, and tumbles into a world of bright, fresh colours where she makes three new friends: a fawn, a duck and a bunny rabbit. The two halves of the story mirror each other, only the first half takes place in black and white pixels and the second half takes place in glorious technicolor, with friends. As with most of my books, much of the story is in the drawing. When it gets late Blip realises it's time to find her way back home. But will she plug back into her giant computer? I recently discovered that McDonalds now have little smart tablets filled with games, so the kids can now glue their little eyes to vivid pixels, while their parents catch up on Facebook. Call me old-fashioned, but I think that's actually quite sad. I recently read an online review, possibly on Goodreads, in which someone said something along the lines of 'Get with the times. Screens are here and make life better...'. I'm badly paraphrasing, but I actually agree with the reviewer. 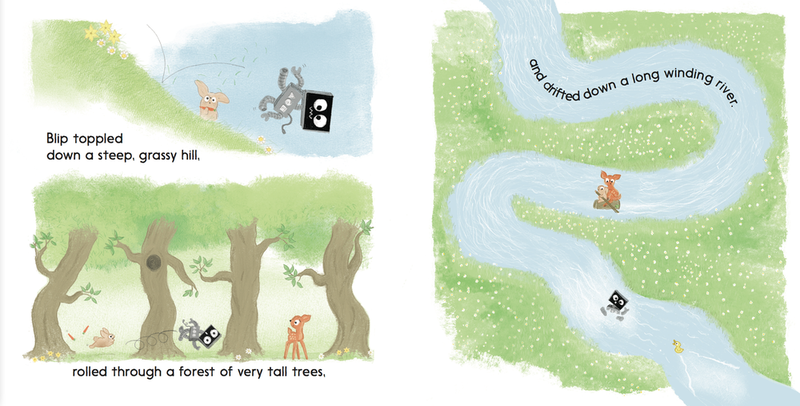 My book is quite simply a playful reminder of all the wonders that exist just beyond the screen. I think the best childhood memories come from exploration, adventure and the great outdoors, all of which I believe are good for the soul. Computers are amazing and they've revolutionised our lives in so many brilliant ways. Smart phones, iPads and games consoles are all valuable in their own way, but childhood memories of building forts with my friends in the desert? Priceless. I'd rather have that than an iPhone 10. All of my picture books are first published in the UK. Buy in Canada, Japan, Italy, Germany, France, Taiwan. For other countries, please visit your local or online bookstore. Below this photo is my frantic I-can't-do-this Twitter thread. It's here! The book is out. 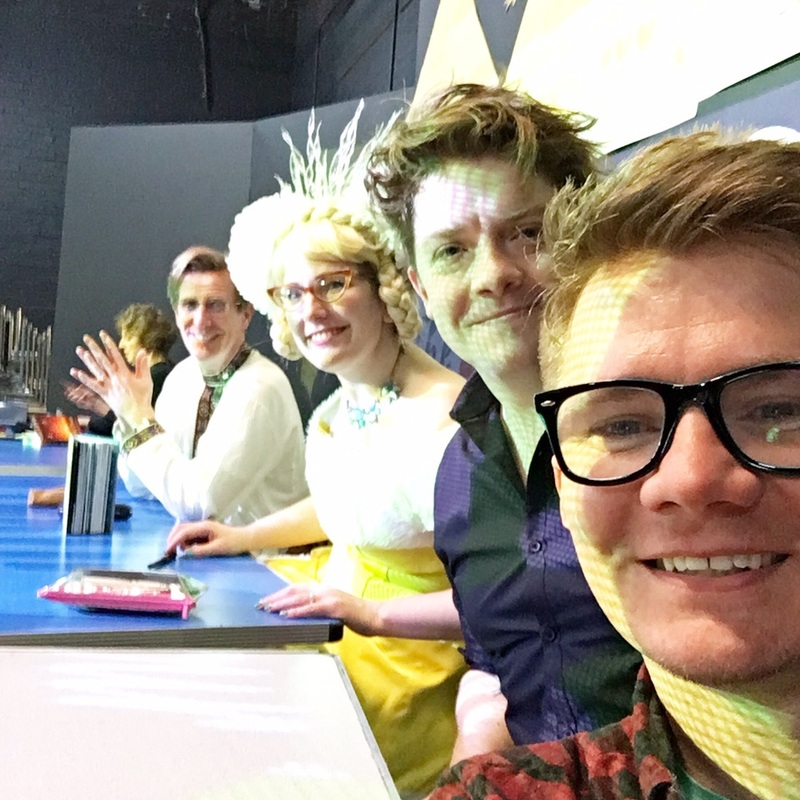 I've uploaded a bunch of pics of the launch day to Facebook, Instagram and Twitter. The 4th book in the Queen series is now out in paperback! The Queen's Hat is a windy tour of London. The Queen's Handbag is a wild goose chase across the UK, and The Queen's Present is a global quest for the perfect present! Each book features pages of famous landmarks and lots of fun-to-find details (like the butler, for example). Below are just a few illustrations from each of these books. 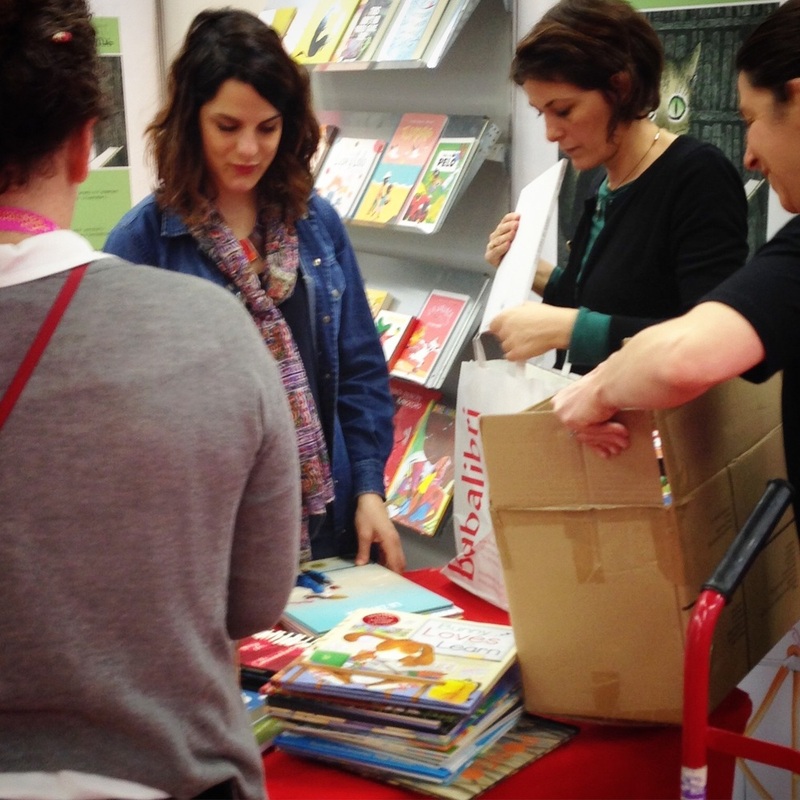 The Bologna Children's Book Fair runs for four days. On the fourth day, publishers begin packing up for the journey home, but they don't always take all their books with them. 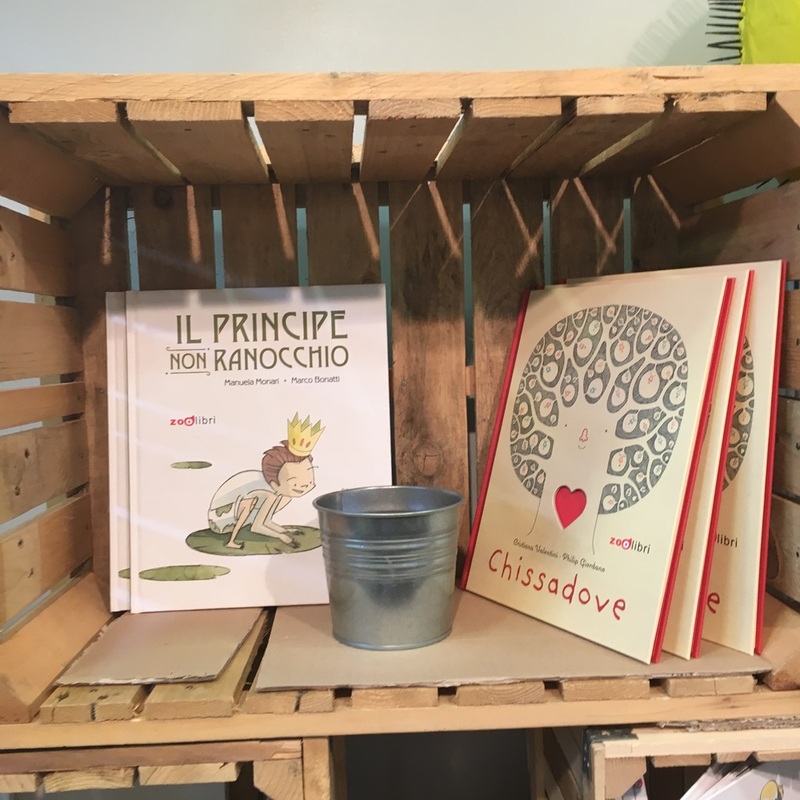 This is something my Bologna buddy and fellow author-illustrator, Elena Arévalo Melville, discovered, so we challenged ourselves to collect as many books as possible to donate to IBBY. 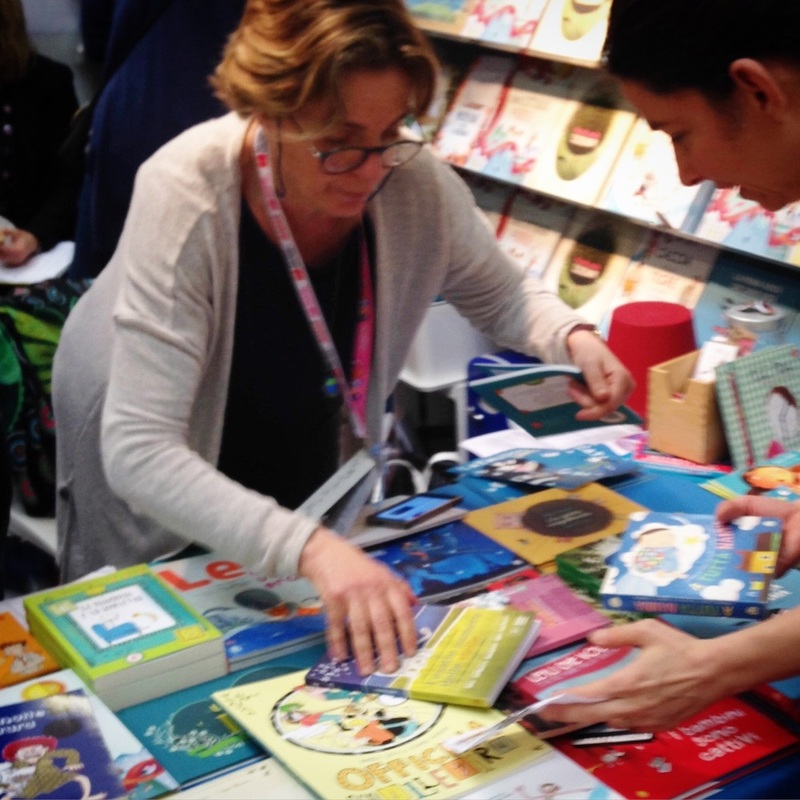 IBBY stands for International Board on Books for Young People and is a non-profit organisation that represents an international network of people from 75 countries; at the fair their Italian branch had a sign asking for book donations for refugee children. Elena and I went on a mission to collect as many donations as possible. 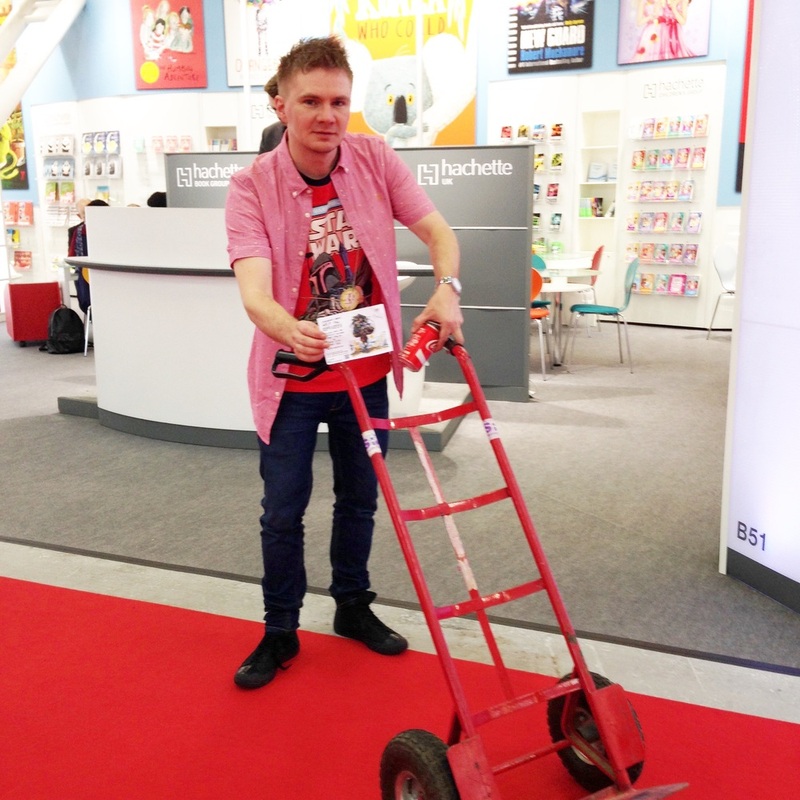 Hachette leant us a red trolley, and off we went. We hashtagged our spree with #HelpIbbyBCBF16. It was a race against time; we wanted to collect as many books as possible before the publishers all packed up; and we had a flight to catch, too. Two or so hours later, we had 100's of books for IBBY. IBBY were delighted. It was magical moment. It felt empowering. In our own little way, we helped. 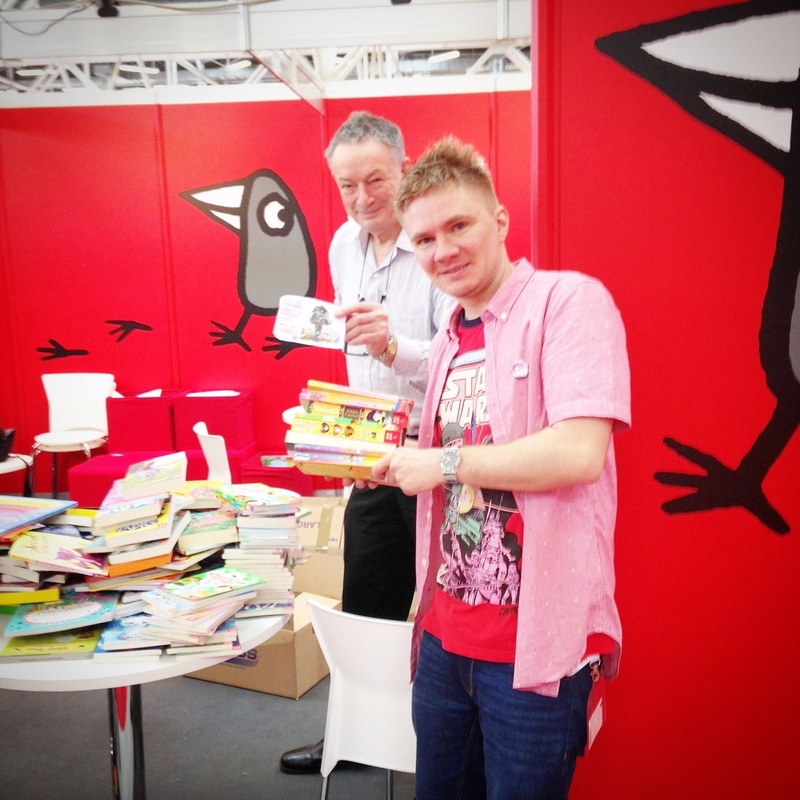 We'd like to thank all the publishers who kindly donated so, so many books! I had intended to post this blog shortly after the Fair, which took place in April, but didn't due to one reason or another. This morning, I found it sitting in my 'drafts', so here it is... Below are some photos of the event. For a much better blog post about our spree, which includes more details, please visit Elena's blog HERE. Last week I visited around 20 bookstores from Gloucester to Glasgow for Books Are My Bag, a nationwide campaign to celebrate bookshops. It was a whistle-stop tour incorporated into a weeklong road-trip to a close friend's wedding in Gretna Green. Each visit was somewhat spontaneous. Every time we took a pitstop, we sought out the nearest bookstores. Most of the stores we visited were Waterstones and WHSmiths, but we did stumble across the award-winning Booka Bookshop in Oswestry - a shop conveniently located near some friends - and Blackwell's and Forbidden Planet in Edinburgh. It was great to meet and chat to so many booksellers, including fellow twitterers. I don't think I've ever visited so many bookstores in one week. From what I can recall, we swung by Gloucester, Worcester, Telford, Wolverhampton, Oswestry, Chester, Liverpool, Manchester, Newcastle, Edinburgh, Glasgow, Blackpool and Stoke-on-Trent. It was a little crazy, I admit, but it was so fun! The only problem now... I need a new bookshelf. Waterstones - though I can't quite remember which town this was in! At Cheltenham Festival there's a Monster in the Hood! Cheltenham Festival was such fun. My event was based on Monster in the Hood and Betty Goes Bananas. 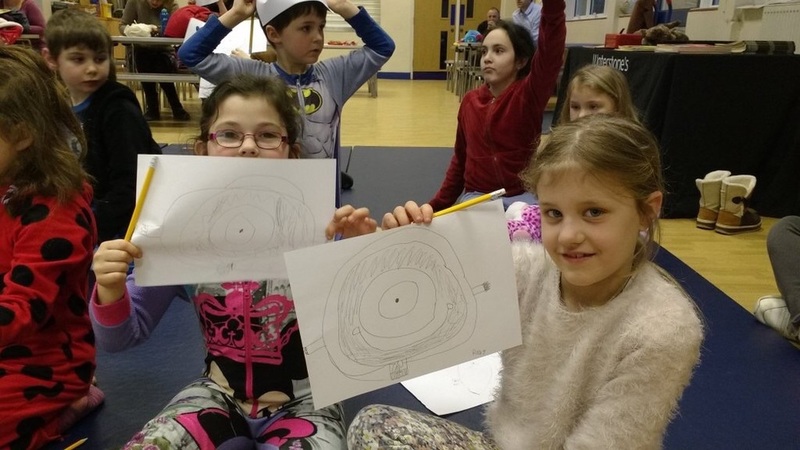 The audience were brilliant and so were their Monster drawings! Below are some pictures and a couple of tweets from the day. Look out for my picture book advice column, with Anita Loughrey, in this month's Writers' Forum. 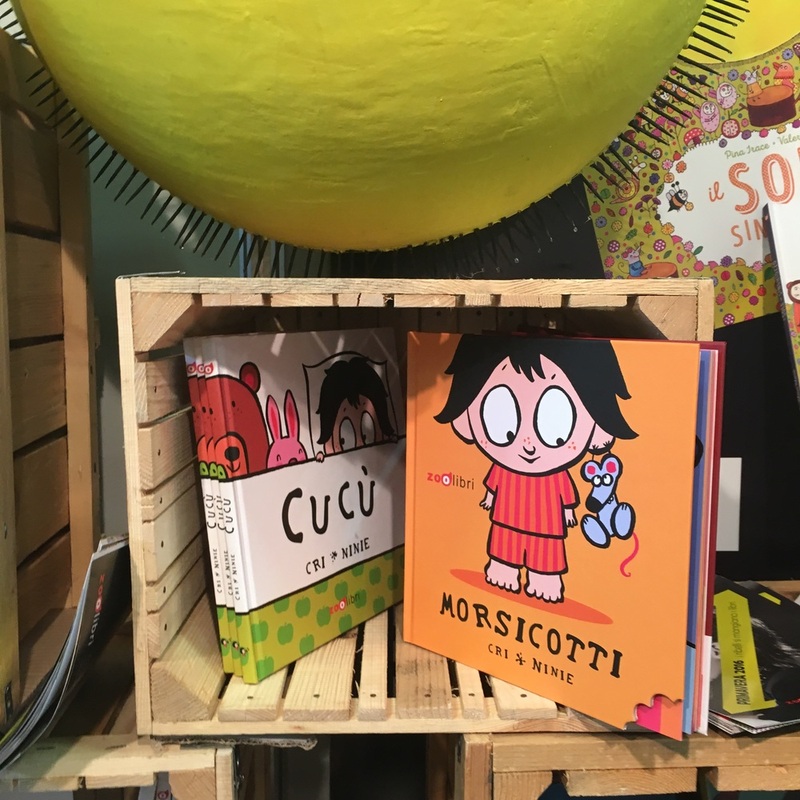 This year's Bologna Children's Book Fair had its highlights. Signing copies of PER FAVORE SIGNOR PANDA at my Italian publisher's stand was definitely one of them. Zoolibri has an absolutely fantastic list of picture books. They've translated some modern beauties by the likes of Klassen, Jeffers and the recently-translated 'A BEGINNER'S GUIDE TO BEAR SPOTTING by the stupendously talented duo, Michelle Robinson and David Roberts. It's a huge honour to be part of Zoolibri's list. It was amazing to meet illustrator, Maria Moya, at the stand. I was very touched by Maria's gift - a bespoke drawing of one of her wondrous characters reading PER FAVORE SIGNOR PANDA. Her work is magical. Below are some photos of my signing, complete with doughnuts! It was great to meet the awesome team behind the big 'Z'. An illustration for me, by the very talented Maria Moya. Today, the first Mr Panda yoga classes will take place across the UK. The craze started in California, and now it's set to take the UK by storm. As of today, no less than 1,546 UK gyms will start holding Mr Panda yoga classes. Each class will be led by Mr Panda, and you'll be stretching to the sound of doughnut themed songs, like 'I Would Do Anything for Doughnuts' by Nutloaf and 'Donut Worry, Be Happy' by Bobby McDough and 'Ice Me Baby' by Vanilla Icing. If that doesn't wet your appetite, low-fat baked doughnuts will be handed out at the end of each class. Quote PLEASE for your first free session. Tweet or Instagram and tag all your 'panda yoga' antics with #MrPandaYoga to @MrSteveAntony for a chance of winning a signed copy of PLEASE MR PANDA. 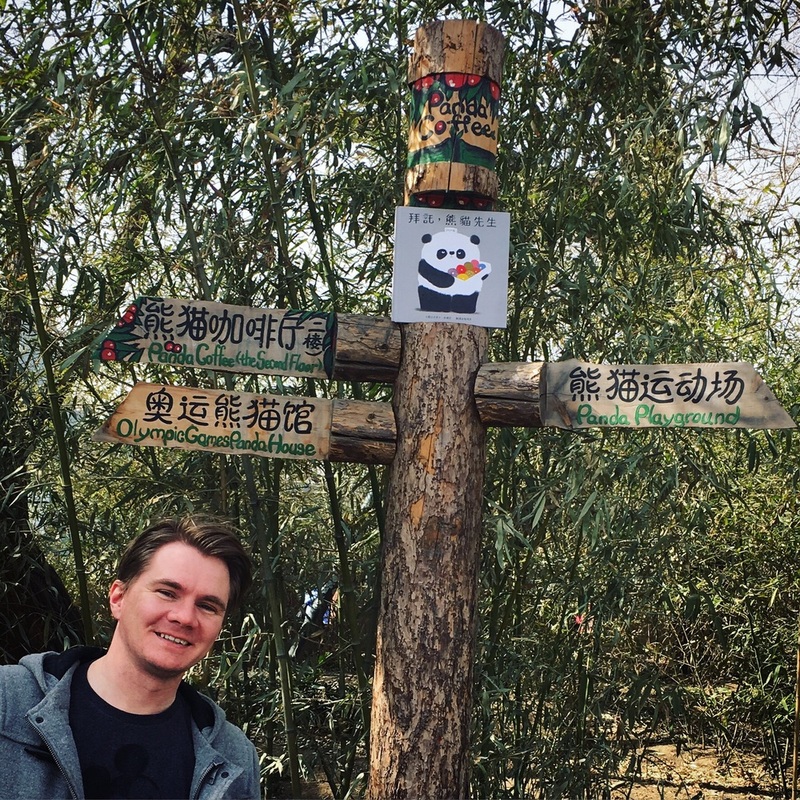 Check out these of photos of Mr Panda Yoga from around the world. Reading is more exciting for us fools with Mr. Panda! Shout out to @mrsteveantony and #mrpandayoga for the inspiration! #yoga #acroyoga #partneryoga #acro #reading Check out http://www.steveantony.com/blog/2016/4/1/mr-panda-yoga-classes-rolled-out-in-the-uk for the story behind the picture! Catch Up: World Book Day, Beatrix Potter, 'Betty' fudge, China and more! 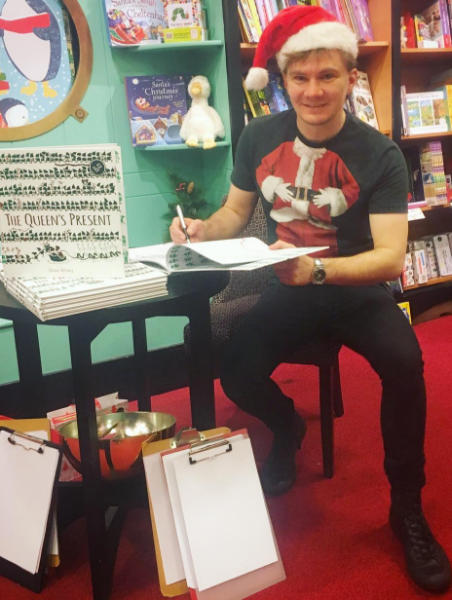 It's not even been two years since my first book, THE QUEEN'S HAT, was published, and, already, I've just finished my TENTH author-illustrator picture book. The Japanese edition of GREEN LIZARDS VS RED RECTANGLES arrived last week. 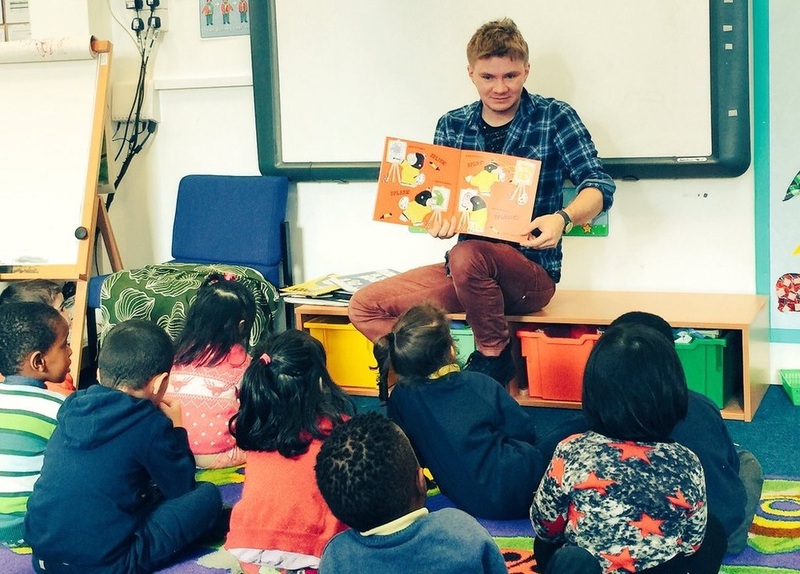 Reading Betty in Hackney schools for Pop Up Festival. 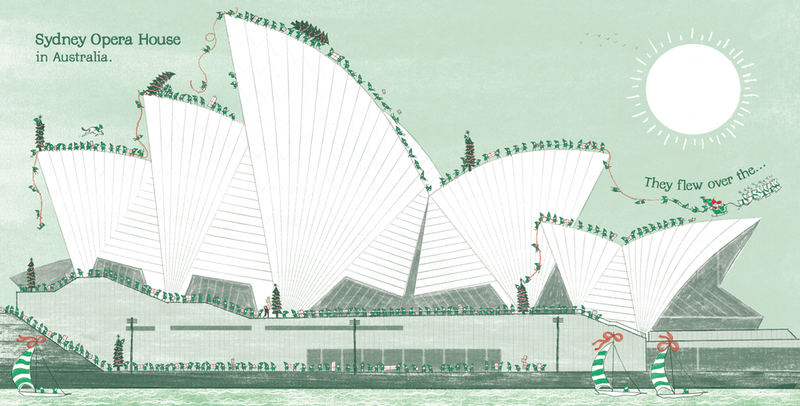 A spread from 'THE QUEEN'S PRESENT'. Yes, she visits China (and other countries) on Christmas Eve, in search of the perfect present. But writing and illustrating books is only part of my job as an author-illustrator. Some people tend to think that I sit at home all day drawing and writing. This couldn't be further from the truth. I probably spend about half of my 'work time' drawing and writing. The rest of the time I'm out and about holding events up and down the country and sometimes overseas. Also, a great deal of my time is spent carrying out mundane administrational tasks. Sometimes I can spend a whole day filing receipts or responding to emails or organising my schedule. 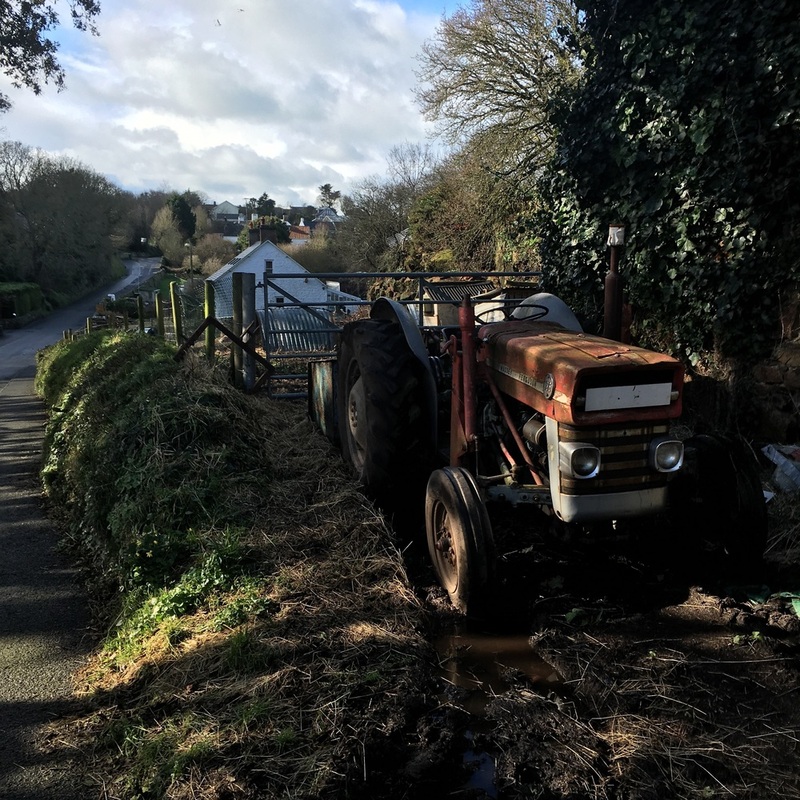 The past 22 months have been jam-packed, but the last few months have been especially busy, and, unfortunately, I came down with a horrible flu virus last week. It was probably my body's way of telling me to stop! And it did make me stop, which sadly led to the cancellation of a few of my author events. Fortunately, I'm feeling a little better now, and this week I've been organising the year ahead. As far as school events go, I'm pretty much fully booked now until October. I'm currently working on a brand new book, which I'm super excited about because it's so different and it explores relatively unchartered territory. It's been a while since I updated my blog with photos, so here are a bunch of photos from the past month. Somehow, I've managed to juggle 30 events along with the completion of my 10th picture book. 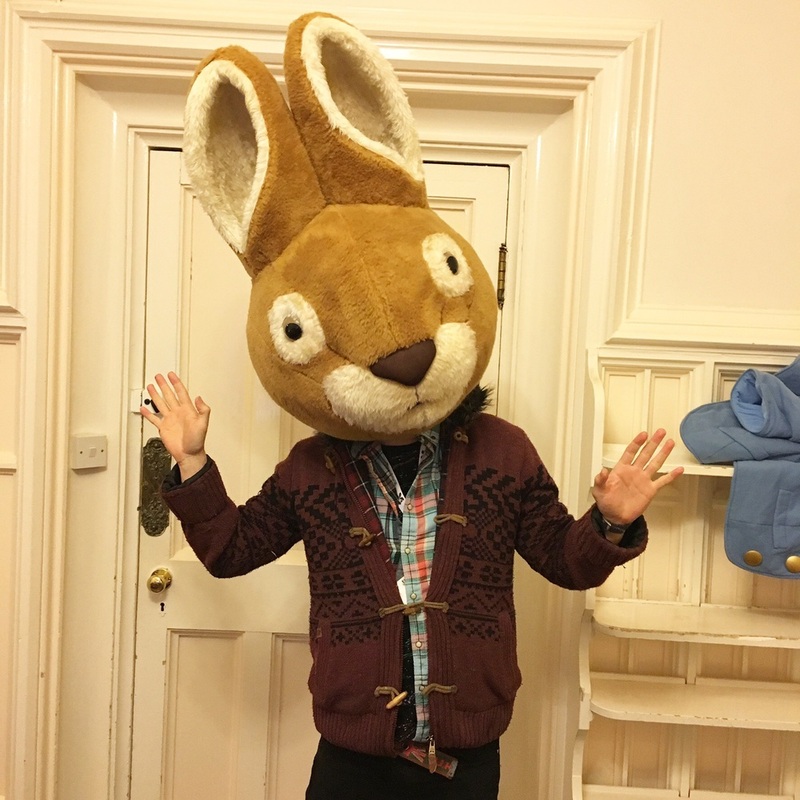 I've travelled to the Lake District for Beatrix Potter's 150th anniversary, I've been all over the place for World Book Day week, I took BETTY GOES BANANAS on the road, and I even travelled to Beijing. 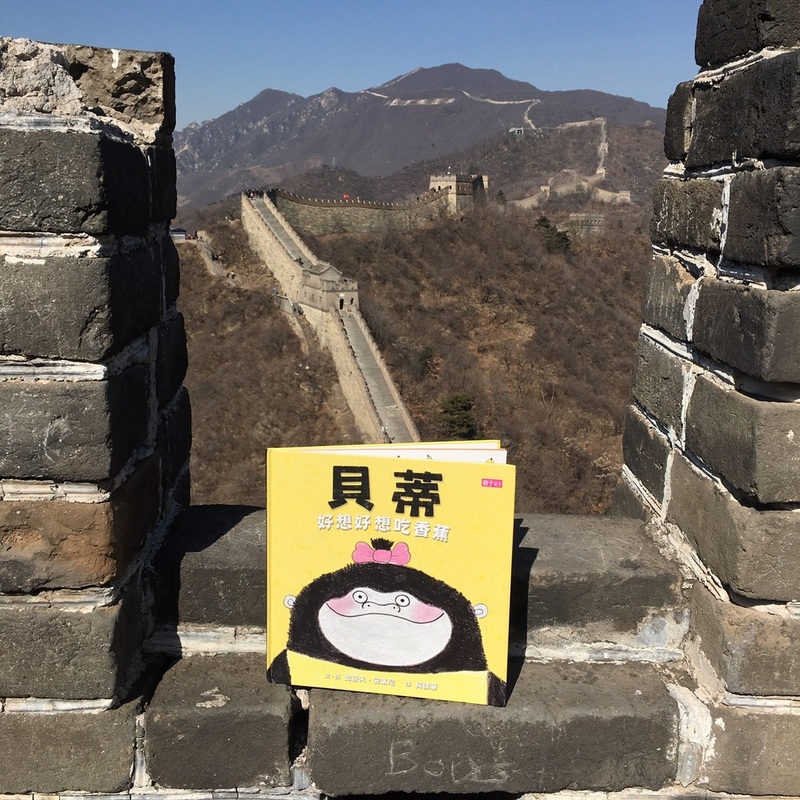 Betty on the Great Wall. Drawing Mr Toucan for Salisbury Library. Some budding artists drew Mr Toucan. Drawing the Monster from the yet-to-be-published MONSTER IN THE HOOD at a BETTY GOES BANANAS pyjama party in Salisbury. The French edition of BETTY GOES BANANAS IN HER PYJAMAS arrived last week. All set for an event in London. 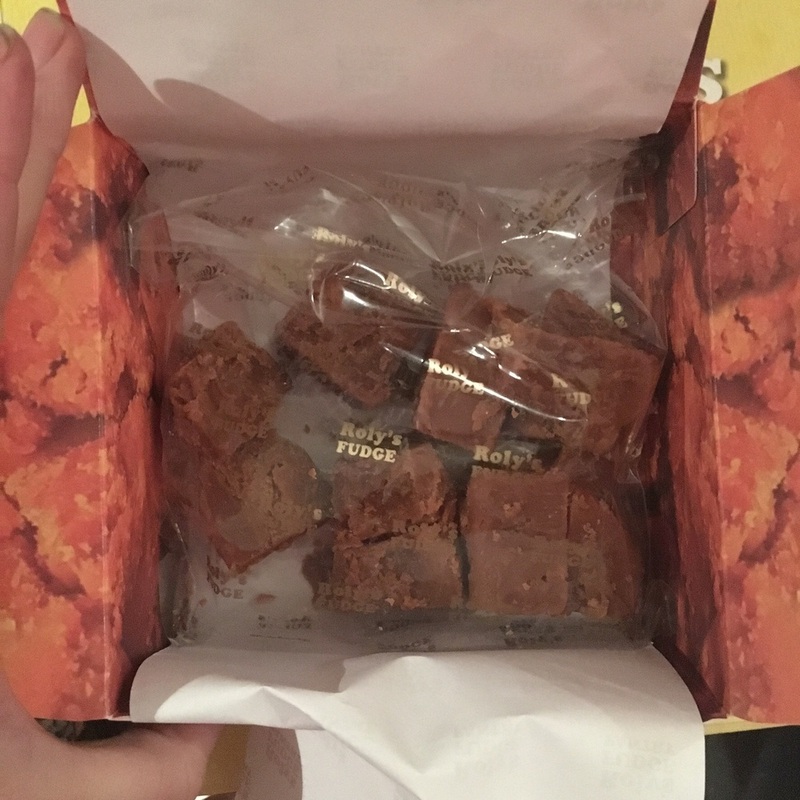 Roly's Fudge in Salisbury kindly gave me some BETTY banana fudge. 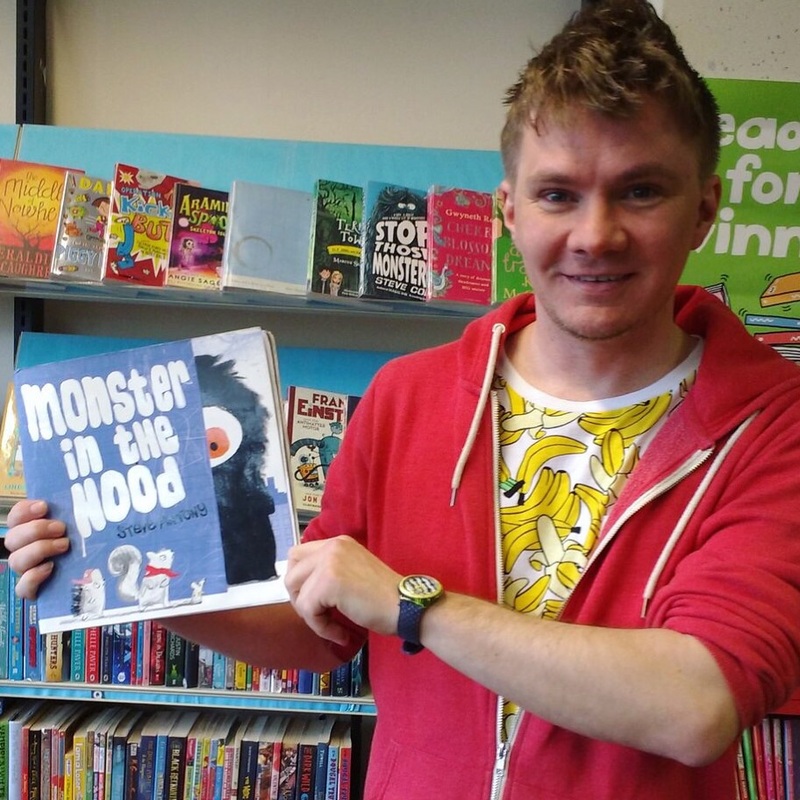 MONSTER IN THE HOOD isn't out in the UK until June, but that didn't stop me from reading it during my BETTY tour with OUP. They loved it - phew! Burdett Coutts School in London named one of their chicks after me (back, right)! With Philip Ardagh, Tracey Corderoy and Benji Davies at Wray Castle. It was The National Trust's very first children's book festival. For the National Trust event, I stayed next door to Beatrix Potter's house. 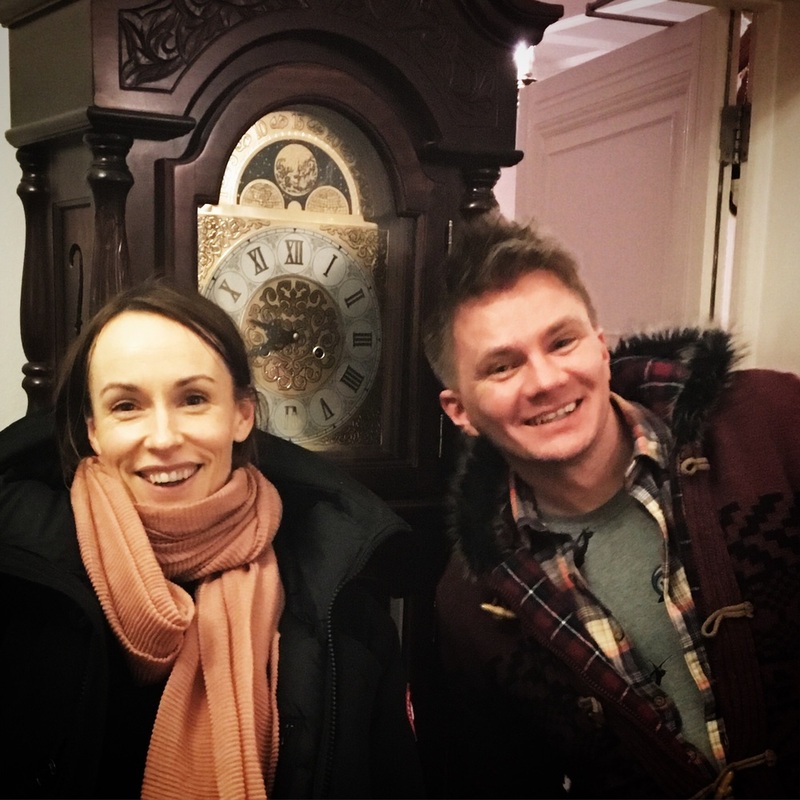 Exploring the guest house with Sophy Henn. 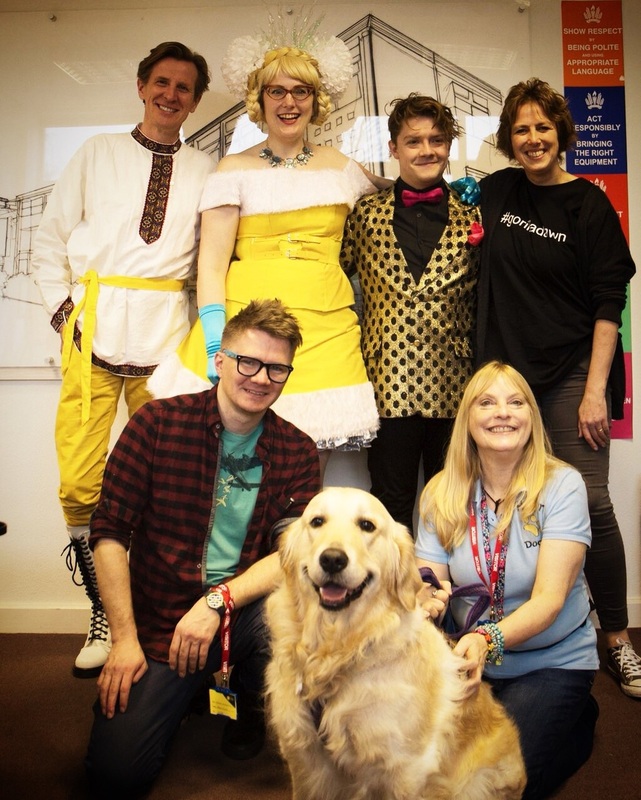 Philip Reeve, Sarah McIntyre, Steven Butler, Gill Lewis, me and Megan Rix (and Bella). I attended a fundraising event held by The National Literacy Trust and Boots, where I picked up Zookeeper Zoe, a book to help children with their sight. The fundraising event was a smart affair. Many photos were taken by the official photographer. I took one quick snap before leaving my London hotel room. 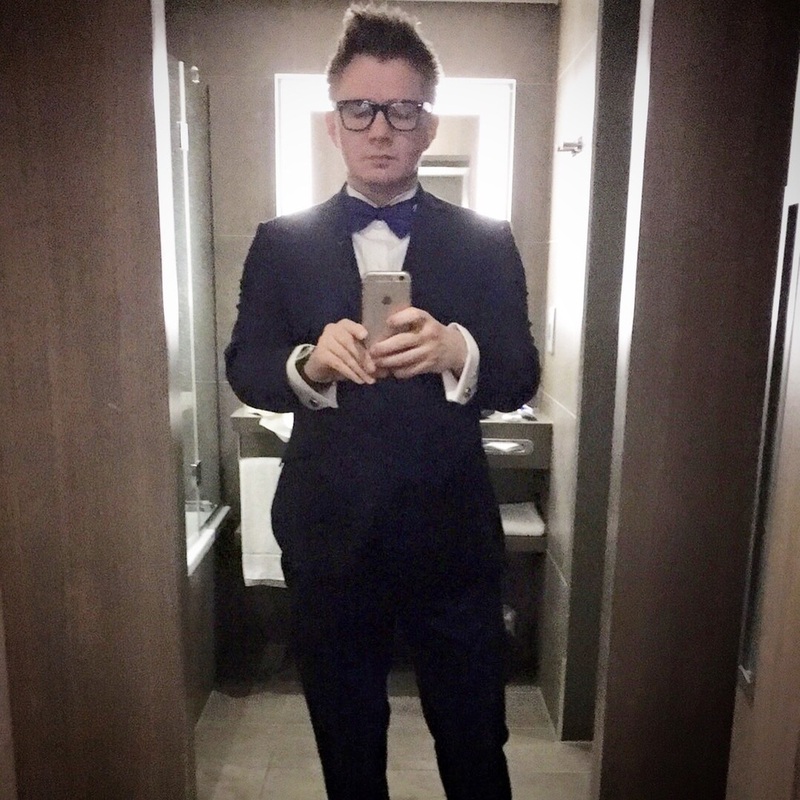 A blue suit and bow tie, with brown brogues (not pictured). 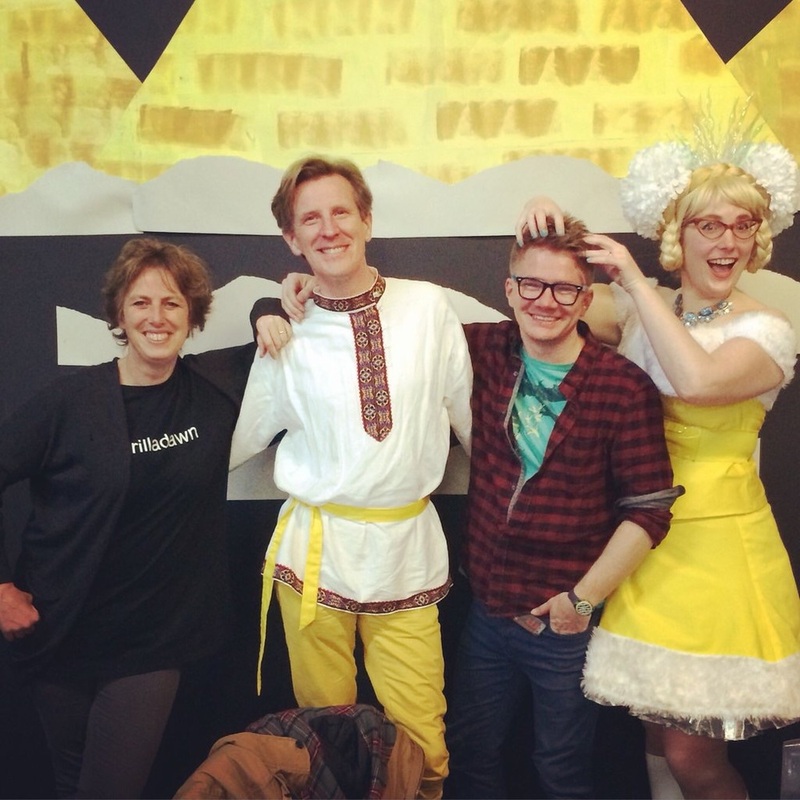 BBC Interview: What does it take to make a children's book? This is me, moments before my 14th and final school event in Guernsey: a small island in the English Channel, just off the coast of Normandy. It's where Victor Hugo wrote Les Misérables. It's where rare golden goats graze. It has historical castles, sandy beaches, cobbled streets and quirky shops. 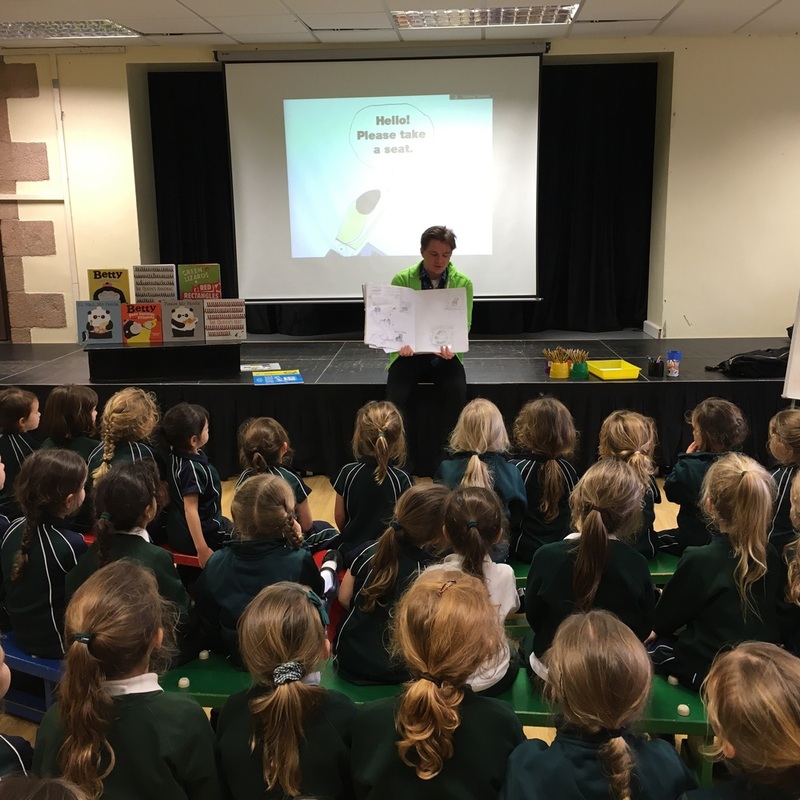 I was there for Guernsey's Children's Book Week: a week to celebrate the sheer joy of books, filled with fun and inspiring events organised by Guernsey's fantastic School Library Service. Almost a year ago, the library invited me to take part, and weeks before my arrival I knew exactly which schools I'd be visiting. All of the nitty gritty details, including all the tech stuff, like laptops, screens, papers and pencils, were clarified well in advance. And the hotel? It was perfect; and only a short walk from the island's indie bookstore, Press Shop. All there was for me to do was remember my memory stick and Top Secret sketchbook. 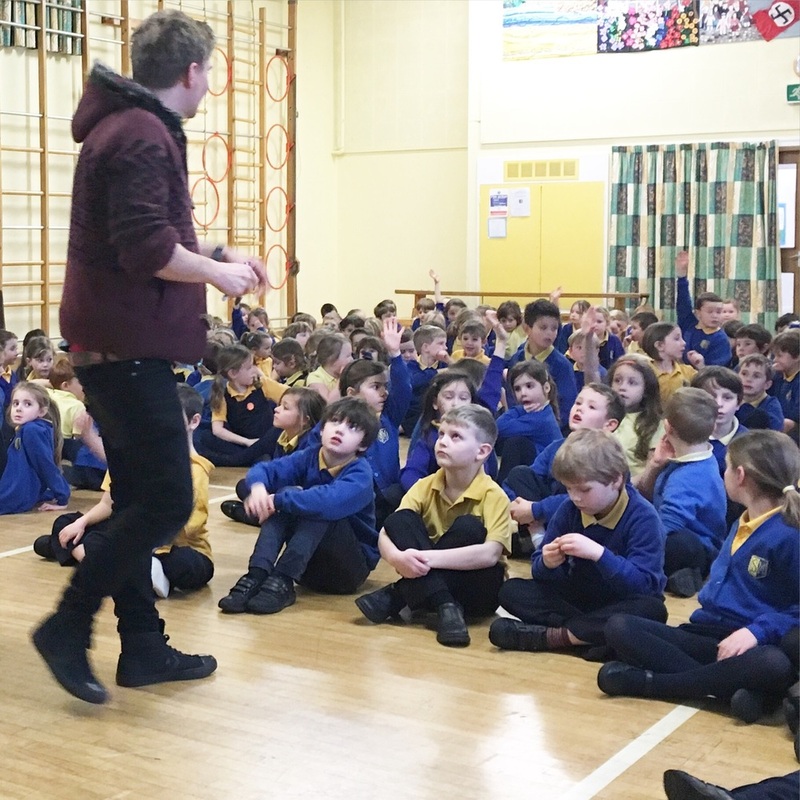 My mission was to visit fourteen schools in five days. Authors, Tommy Donbavand and Nick Cook were there for the week, too. 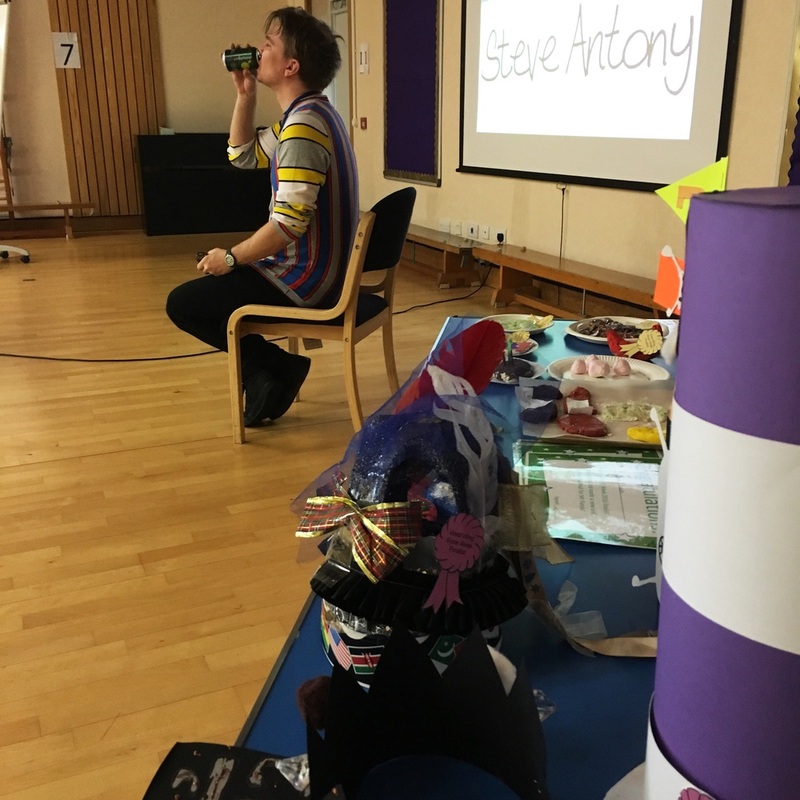 Tommy had a head-start, as he was there for Doctor Who day, which took place on the Saturday before Children's Book Week. Tommy's written for Doctor Who, and he's the author of many books including the successful Scream Street series (now a stop-motion animated series on CBBC). 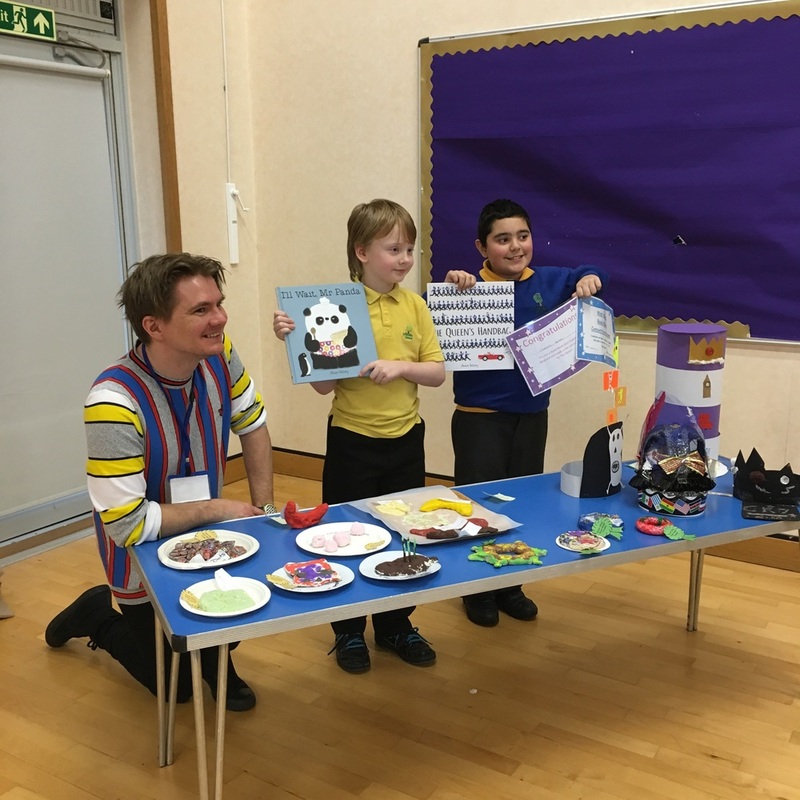 Gaming guru and author of Cloud Riders, Nick Cook, wowed everyone with his tornado machine: a machine that actually creates mini twisters! 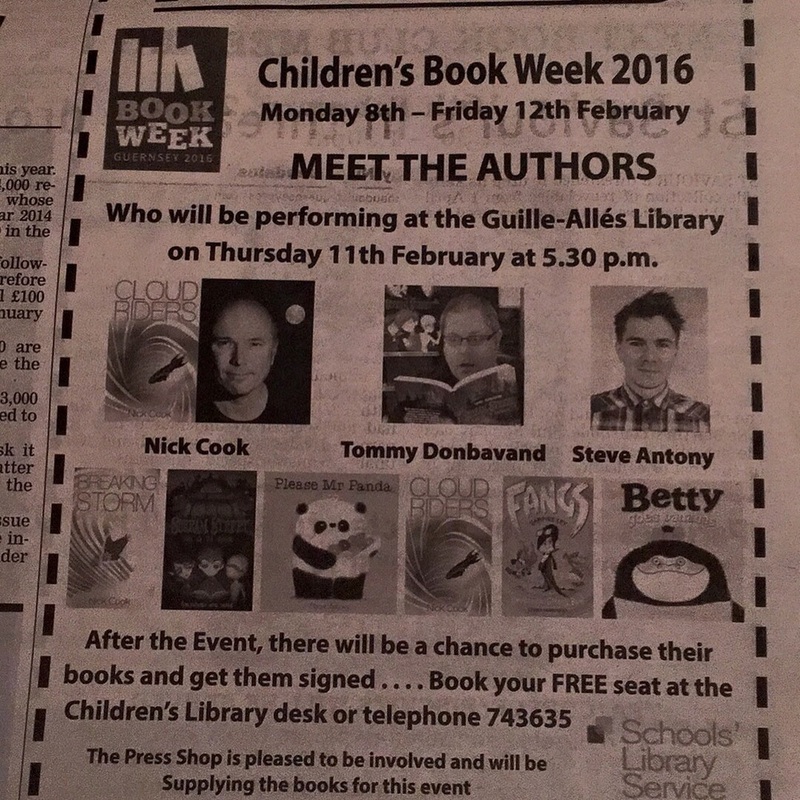 I was there to read my books; draw pandas, corgis and toucans; and eat imaginary doughnuts all week. On the Thursday, the three of us were interviewed by BBC Guernsey presenter, Jenny Kendall-Tobias, alongside the library events organiser, Elizabeth. It was a really fun (and funny) conversational interview that's definitely worth a listen. Afterwards, we took part in a panel event and a glittering awards ceremony, held in the town library, where winning entries to an art contest were announced. I awarded three talented children with signed copies of PLEASE MR PANDA for their zany, innovative doughnut designs. 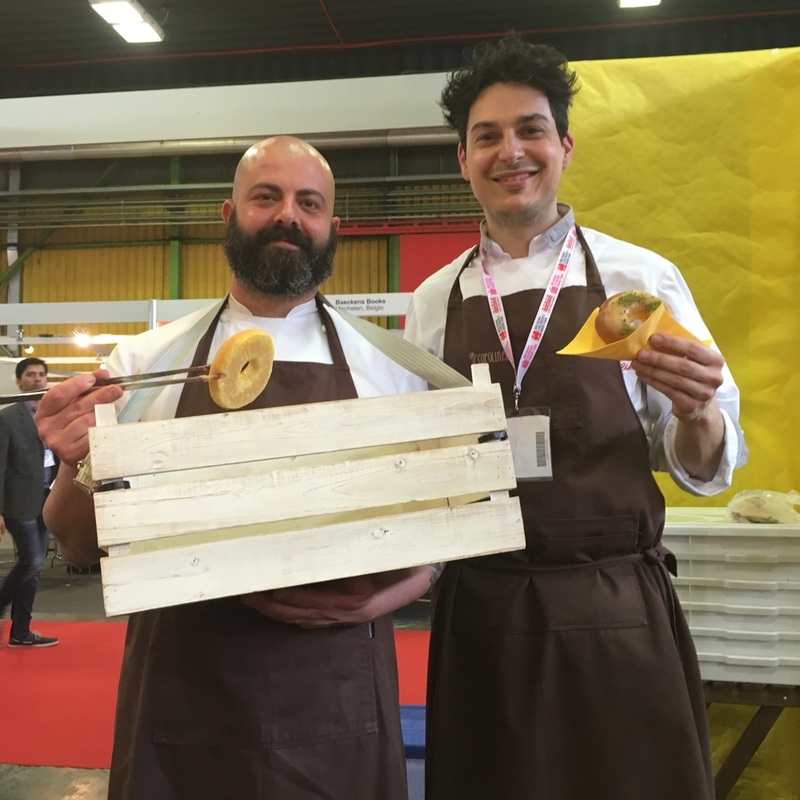 There was a healthy doughnut complete with vegetables, an amusing pig-faced doughnut, and an amazingly constructed abstract doughnut which won 1st place. One of Tommy's winning entries to his 'draw a monster' contest was a fantastically monstrous caterpillar called a CaterKiller. 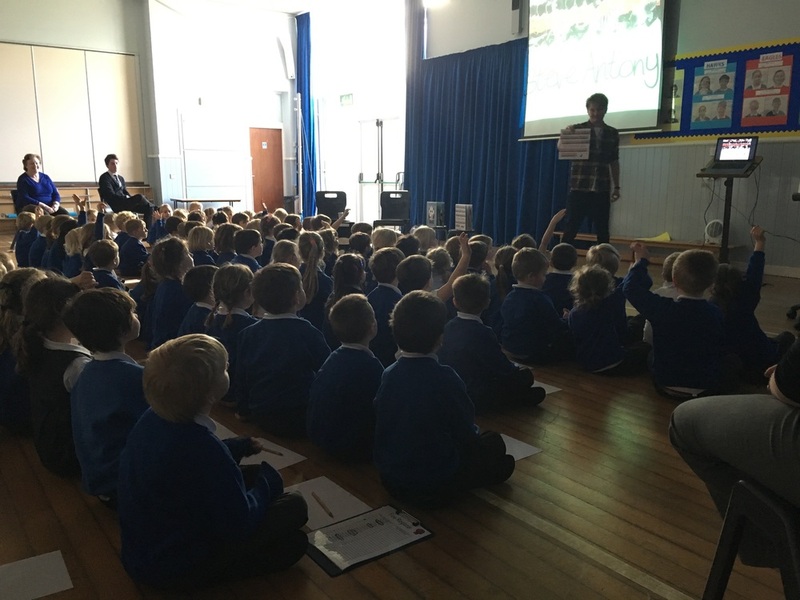 The week was packed with school events. Each morning, a librarian collected me from the hotel and accompanied me throughout each day. I mainly based my school events on THE QUEEN'S HAT, BETTY GOES BANANAS and PLEASE MR PANDA. 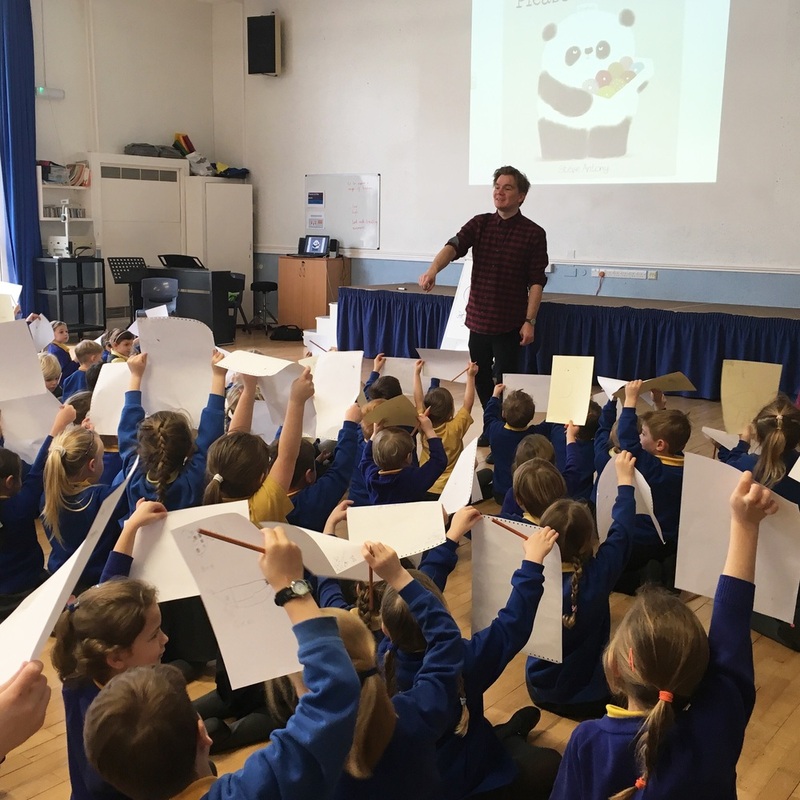 I taught the pupils how to draw pandas, toucans and corgis with shapes and letters. They had great fun screaming along with Betty and spotting the butler in THE QUEEN'S HAT. 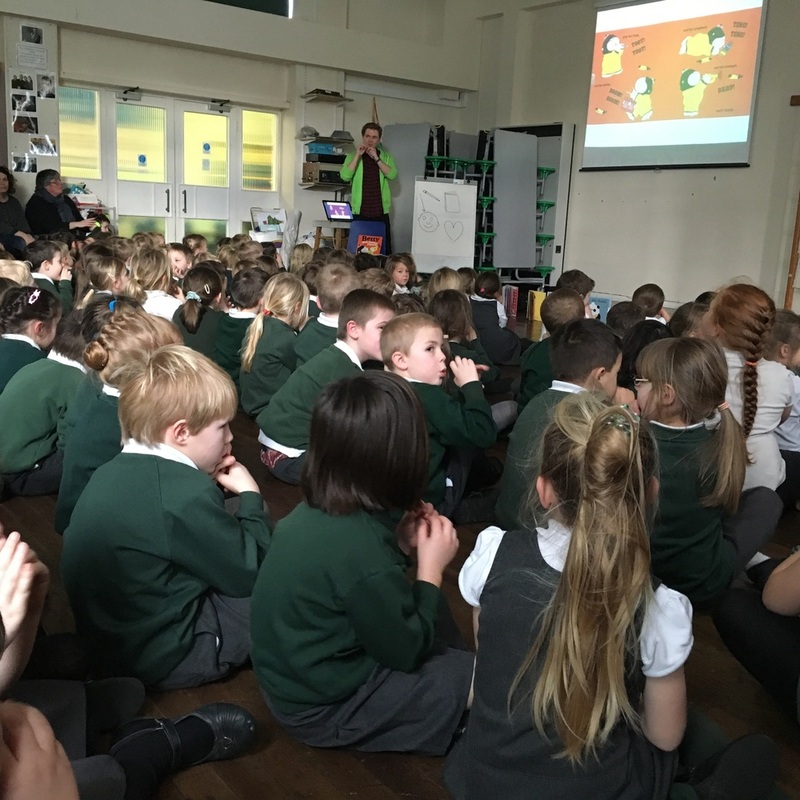 Every school was well prepped for their event, so the pupils were already very familiar with the characters and stories. 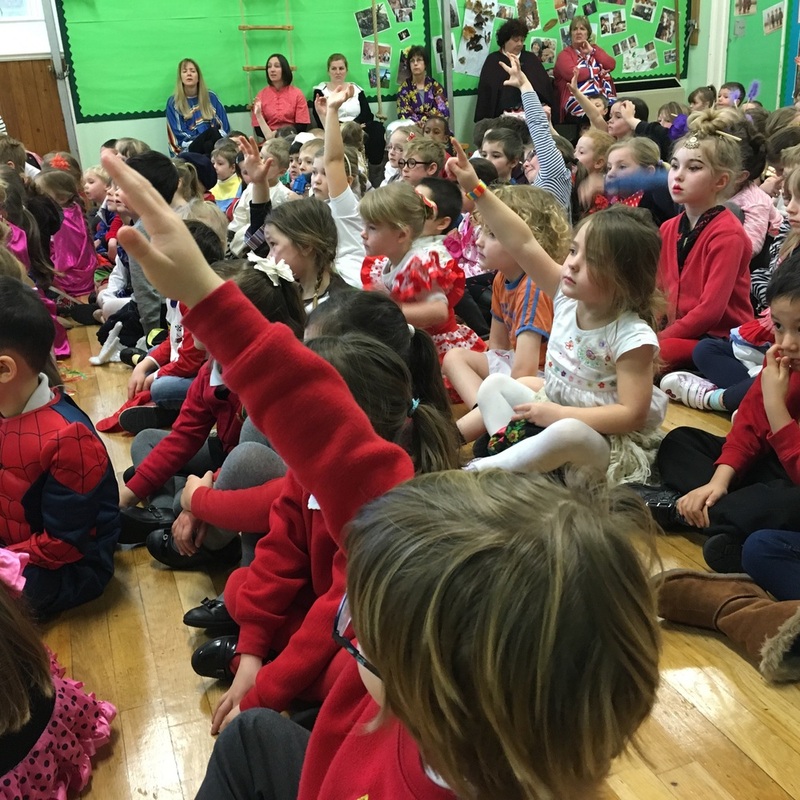 This makes author events so much better, because the pupils are already invested in the characters. This allows us to expand on each story by making up new characters and situations. And they were excited and interested to see how each story began. Ultimately, each of my visits were about inspiring kids to read, create and use their imagination. For my lunch breaks, I was treated to a spot of sightseeing by each librarian who accompanied me. On Monday, Alan gave me a mini guided tour of Vale Castle: a famous, historic local landmark which also features in THE GUERNSEY GOVERNOR"S GLOVES, a brilliantly executed picture book created by Miss Kimber's Class from Vauvert KS1 that tells the tale of how a pair of windswept gloves took the Governor on an impromptu tour of the island (a bit like another story I know). 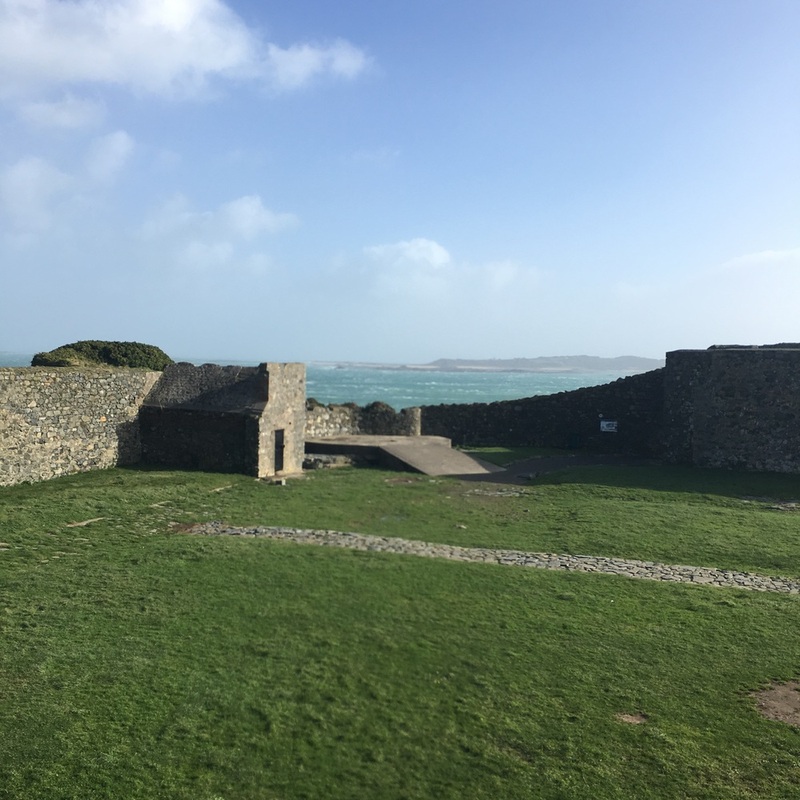 For Tuesday's lunch break, Emily drove us to the West Coast, which had suffered a minor battering from the tale end of Storm Imogene (pictured below). We also braved a freak hail storm to take a very quick 'book bench selfie'. The bench was based on the local classic, The Book of Ebenezer Le Page by G B Edwards, and it was painted by local artists Charlie Buchanan, Lauren Perry and Sam O’Neil (pictured below). 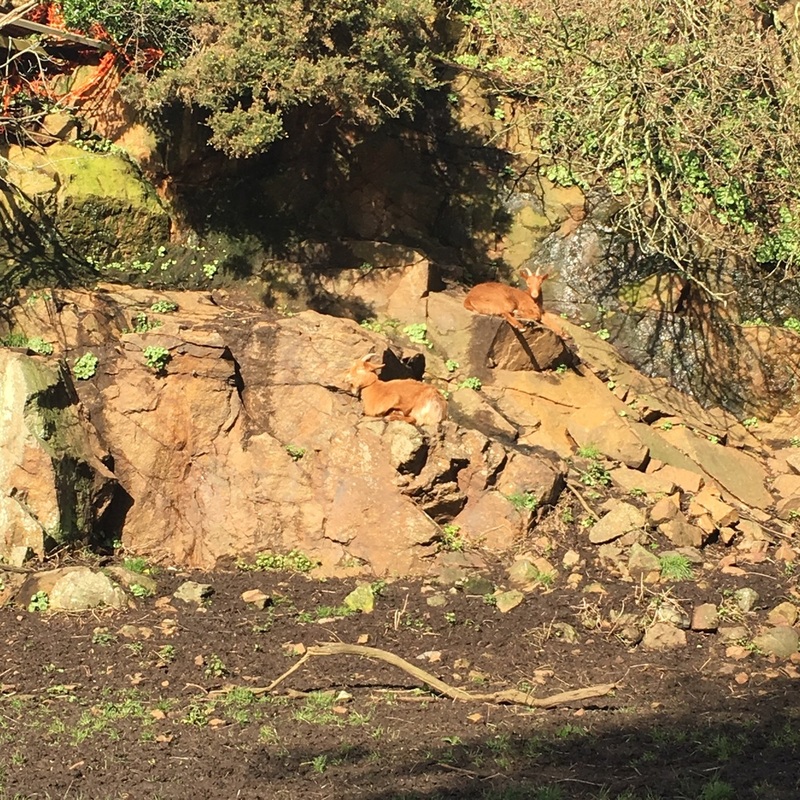 On Thursday, Ellie took me to see the island's rare and mysterious Golden Guernsey: a breed of goat named after its golden fleece. Alan had kindly given Ellie directions to a small holding where we found the golden goats quietly grazing (pictured below). I love discovering new animals, and I love adding rare and endangered animals into my stories. I had Friday's lunch in the airport. 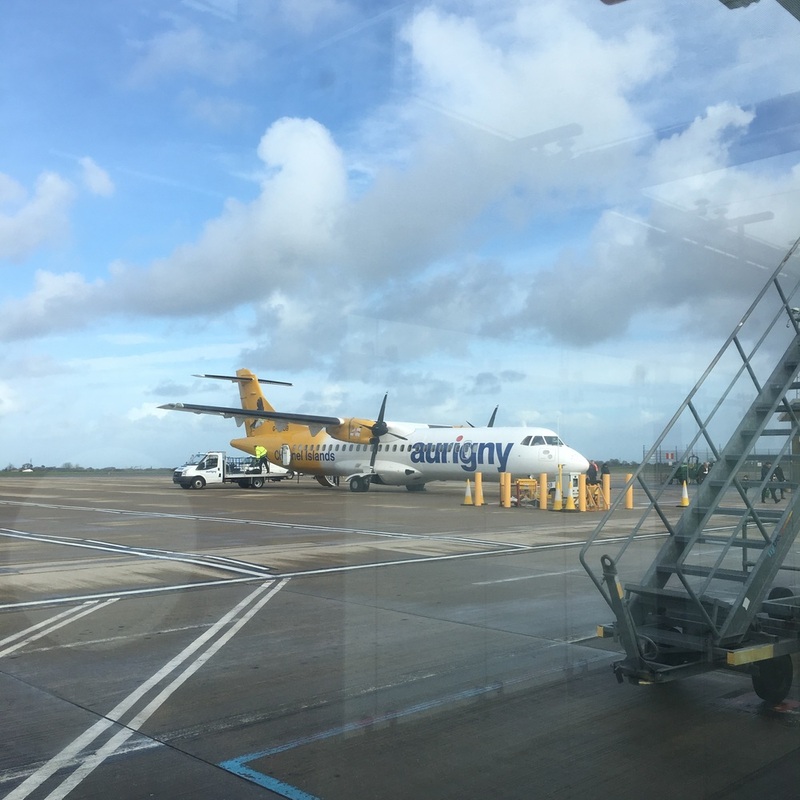 It was sad to say goodbye to Guernsey. I had such a great time. In fact, this has to be one of the best book tours I've ever been on, which is all down to the super-organised and hospitable librarians of Guernsey. I definitely plan on returning. 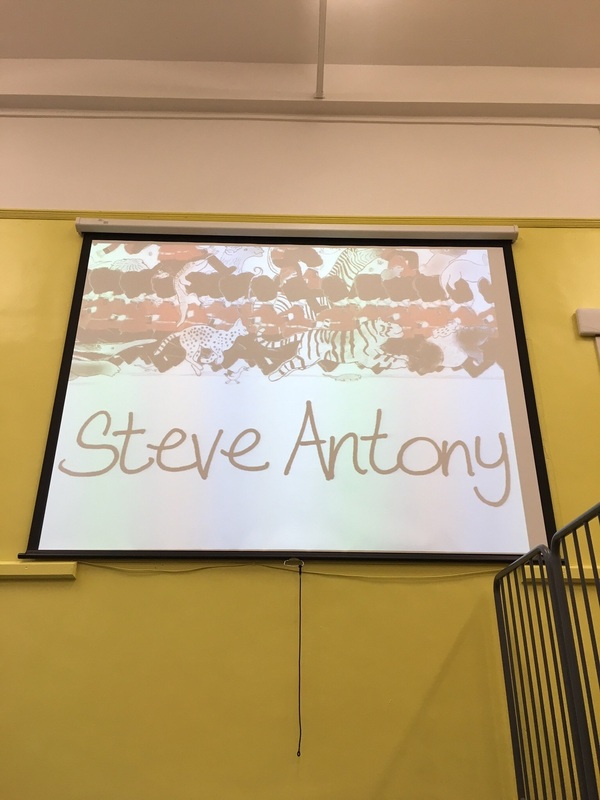 Below are several photos from each of the schools I visited, along with photos of Vale Castle, golden goats, and the aforementioned 'bookbench'. But first, here is a list of some things I didn't manage to snap. A band of bearded folk singers that suddenly popped up behind me, Tommy and Nick in the hotel bar. The cute, shaggy sheepdog that suddenly turned evil when I tried taking its photo. A big independent toy shop. Independent toy shops are hard to come by these days. Dolphins. According to the paper, a pod of dolphins were spotted on the coast. 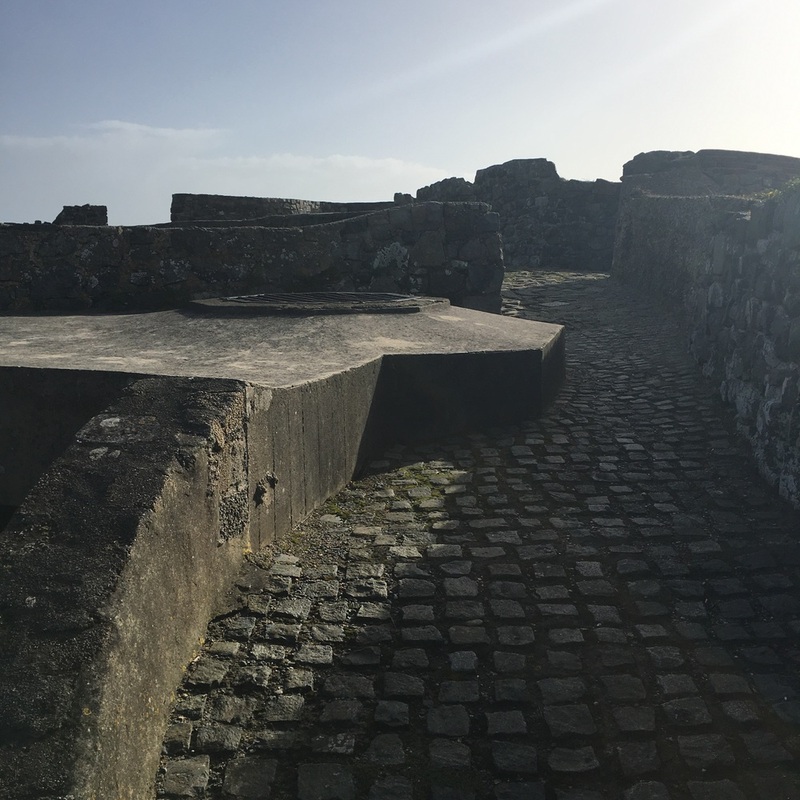 Sark island: a tiny island between Guernsey and Jersey that has no cars and a population of around 500! Spotting butlers at Le Rondin School. One wing of Le Rondin entered a tasty-fruity-treat contest. These are the finalists' creations. Reading I'll Wait, Mr Panda. Another wing of the school made hats. These are the finalists' hats. And the third wing made doughnuts. Here are two of the talented winners with their respective prizes! A page from THE GUERNSEY GOVERNOR"S GLOVES by Miss Kimber's class. A page from THE GUERNSEY GOVERNOR"S GLOVE by Miss Kimber's class. Blanchlande Infants were dressed in around-the-world costumes. Wood for sale and an honesty box. Ellie had to explain to be what an honesty box was. I asked 'Is it where people post their confessions?' It's basically where people help themselves so long as they leave some money. Amazing. 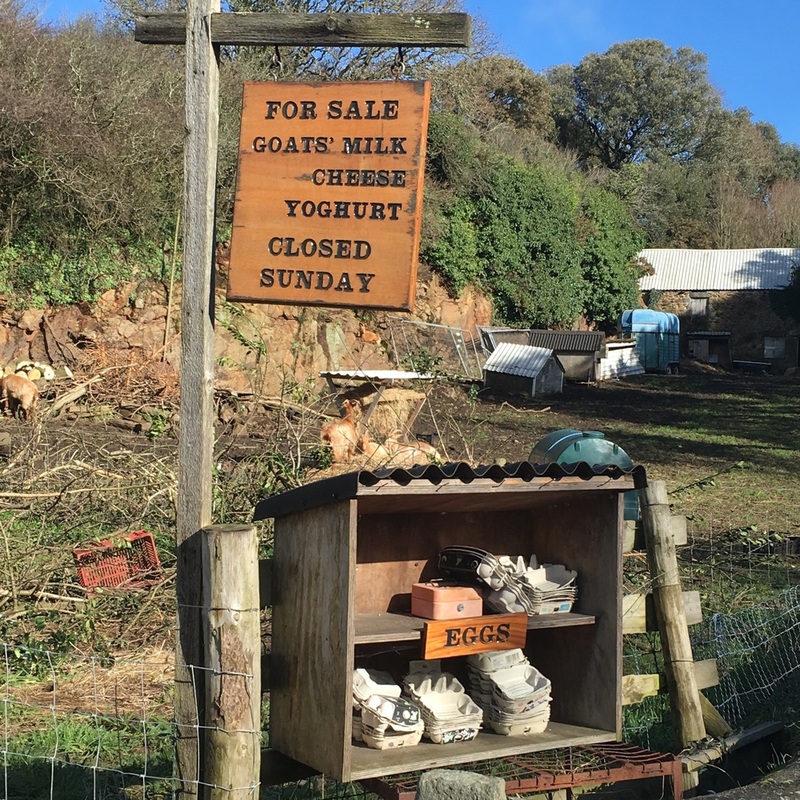 Eggs for sale, and an honesty box. This was a beautiful viewpoint. 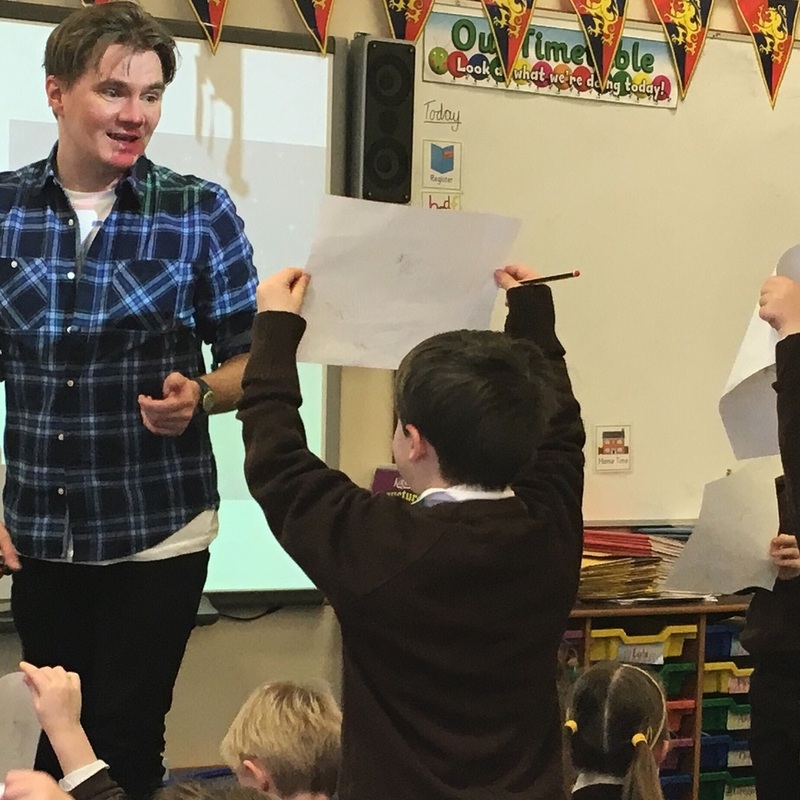 Showing pupils how to draw pandas with shapes and letters. Daleks had invaded the library. Press Shop had a great window display. This was in the island's paper every day of the week. No, that's not dandruff, it's hail. Me and Emily attempting to take a 'bookbench selfie' in a freezing hail storm, but the bench is totally obscured. Pupils made their own hats. 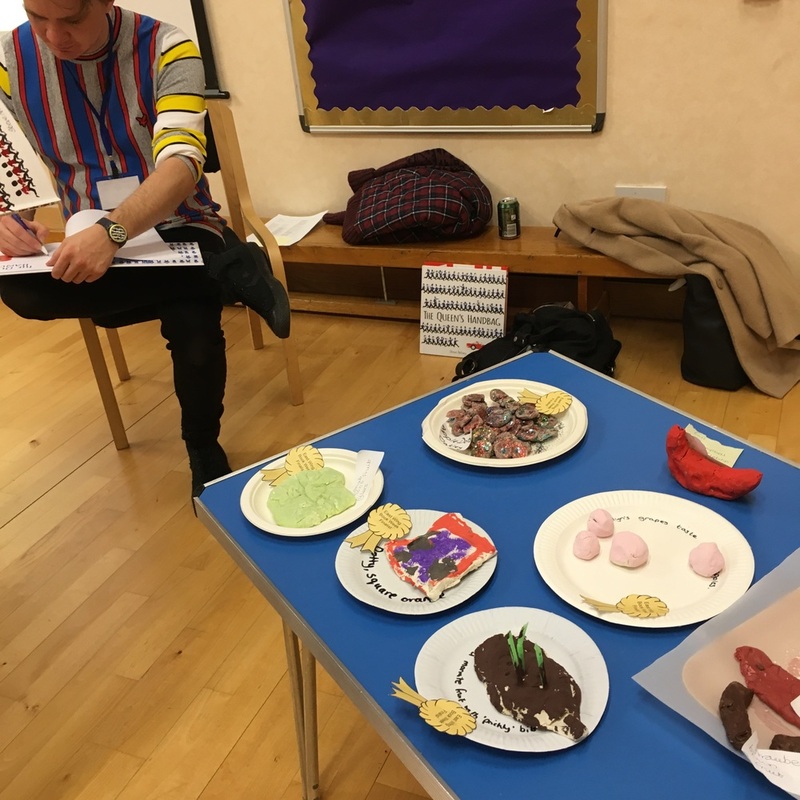 From decorating doughnuts to acting out plays to learning about geography and jungle themed Reading Corners, TEACHERS from the UK to Australia have invented CREATIVE LESSON PLANS and FUN ACTIVITIES based on my books. 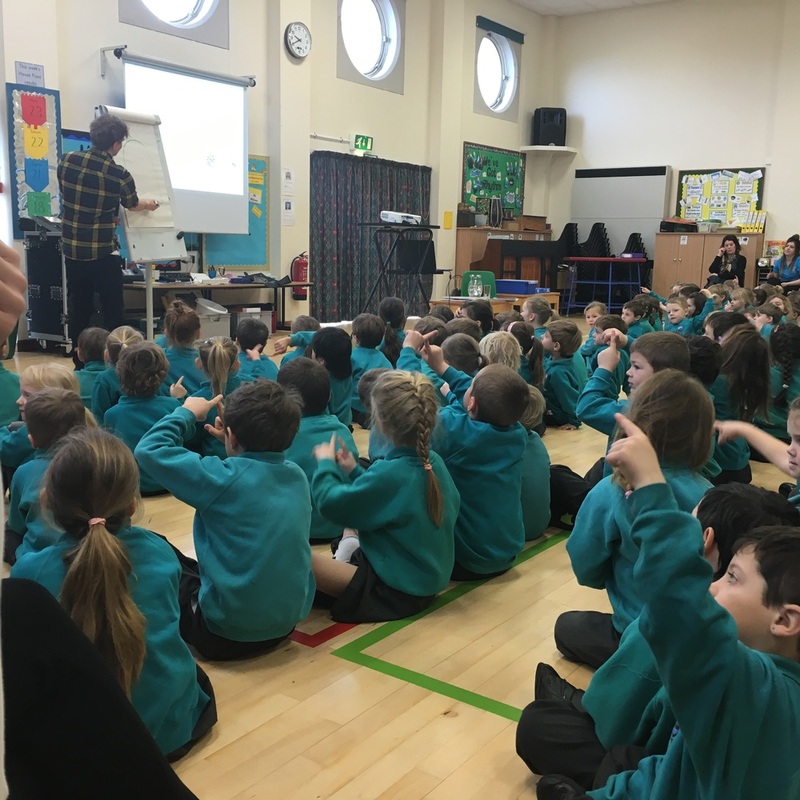 In response to the many emails I've received from teachers, I've created a web page devoted to lessons and activities especially for teachers, librarians and booksellers. 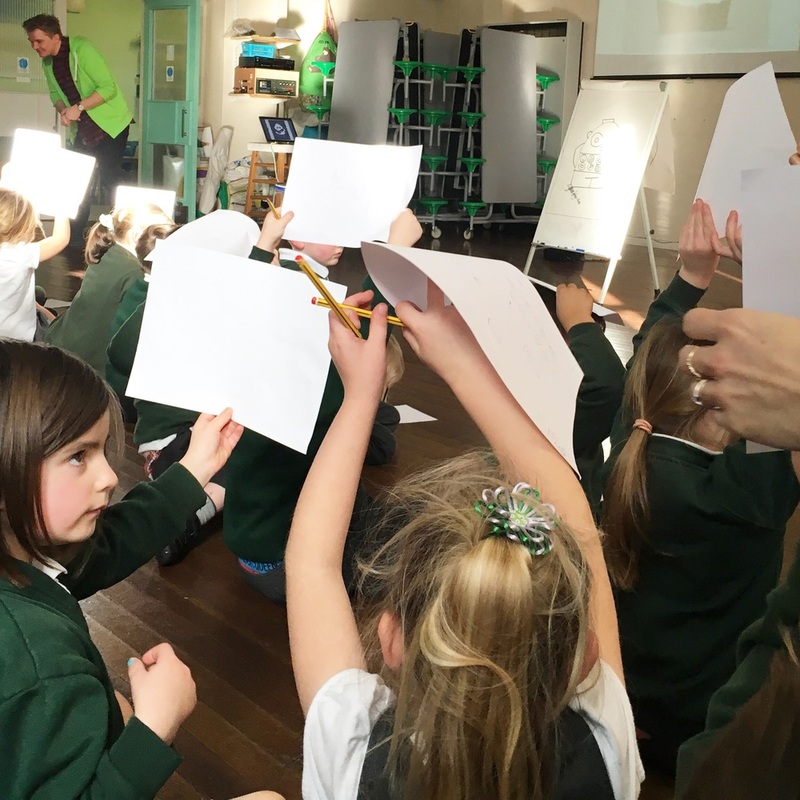 Most of these lesson and activity ideas are suitable for KS1 (ages 5-7) pupils, but they can also be tailored for younger pupils. I have indicated a recommended age group next to each lesson based on my experience from school events, but you can tailor them for just about any age group. Press HERE to visit the corner of my site that's especially devoted to teachers and librarians. Ideally, I'd like to write individual blog posts for each of my events. But this summer has been pretty manic, so I've fall a little behind with my blog. Here are some of the photos from several of my events over the past few weeks. It's been a lot of fun! Bath Festival. I'm in the famous red chair! Bath Festival. OK, so now I've got to share the chair with Jo Empson, Sophy Henn and John Mclay. An event with Askews Library Services in Preston. This is at the Yaxley YakketyYak event, held by Cambridgshire Libraries. I'm with Trudi Esberger and Marion Lindsay. These antennae are by Trudi, based on her picture book THE BOY WHO LOST HIS BUMBLE. Signing stock at Cirencester, Waterstones. Lots of books to sign! 400, I think!